Melissa Highton (The University of Edinburgh Learning Teaching and Web Services), Jock Millican (LINC Scotland), Morna Simpson (GGS), Katie Lyne (CivTech), Jen Paton (Administrate), Andrew Williams (Administrate), Chris Brind (Waracle and Exception), Dr Jamie Graves (ZoneFox), Jane Grant (Edinburgh College), Issy Urquahart (Craneware), Jessica Mullen (Create Future). Photo credit: Girl Geek Scotland. 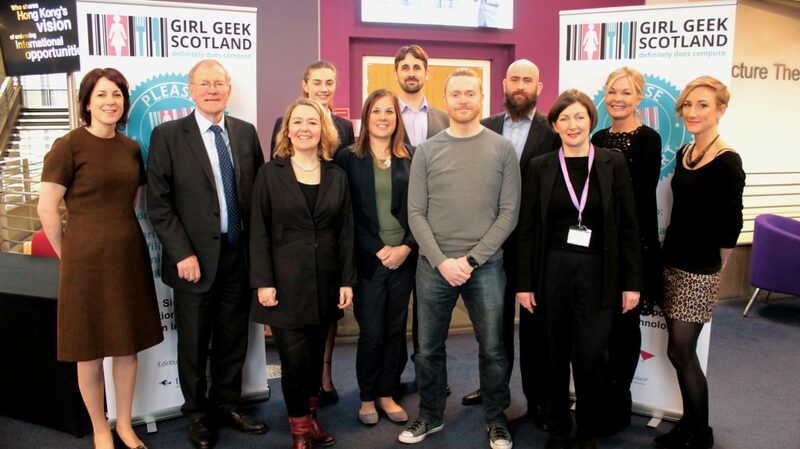 Leading digital technology network Girl Geek Scotland has launched a new Declaration Of Support For Women In Technology with backing from LINC Scotland, Administrate, Skyscanner, Create Future, & Waracle and Exception. The new Declaration aims to improve equality in IT across Scotland. Currently only 18% of the Scottish IT workforce is female – impacting not only workplaces around the country but also the economy. Sharing Best Practice: To improve working processes, culture and environment to appeal to and retain women across the digital technology ecosystem. Profiling Women: Either by offering speakers, mentors or role models for events across the digital technology ecosystem. Training for Women: Supporting and enabling the widest distribution of lifelong training and resources in digital technology sectors, sub-sectors and associated sectors across Scotland. Being Visible Allies: Promoting women in technology by contributing to events and supporting the widest distribution of promotional materials to inspire women to enter into or remain in digital technology sectors. Morna Simpson thinks the stakes are too high for Scotland to get this wrong. “Digital Technology is a growing sector in Scotland, and becoming a more important part of our economy every day. However, a global, digital Scotland will only succeed with digital talent that is globally competitive. “Currently women only make up 18% of the Digital Technology workforce. Despite a strong education sector only 38% of women graduating from IT courses hold IT positions. If Digital Technology employers cannot find a way to attract more women into careers in tech, then the whole economy will continue to be constrained by lack of digital expertise. It is on the back of this activity that Girl Geek Scotland recently won a tender to deliver a Role Model and Mentoring Framework in Digital Technology for School Aged Girls across Scotland, on behalf of Skills Development Scotland. Girl Geek Scotland (GGS) is a network and community for women working with Creativity, Computing and Enterprise, and related sectors in Scotland. GGS aims to develop a network of women, who are able to support each other at entry-level and throughout their careers, working at the intersection between these areas.